Saint Lucy's Day is a Christian feast day celebrated on 13 December in Advent, commemorating Saint Lucy, a 3rd-century martyr under the Diocletian Persecution, who according to legend brought "food and aid to Christians hiding in the catacombs" using a candle-lit wreath to "light her way and leave her hands free to carry as much food as possible". Her feast once coincided with the Winter Solstice, the shortest day of the year before calendar reforms, so her feast day has become a Christian festival of light. Falling within the Advent season, Saint Lucy's Day is viewed as an event signaling the arrival of Christmastide, pointing to the arrival of the Light of Christ in the calendar, on Christmas Day. 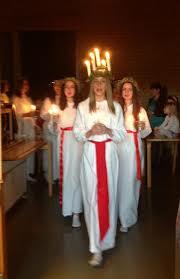 Saint Lucy’s Day is celebrated most commonly in Scandinavia, with their long dark winters, where it is a major feast day, and in Italy, with each emphasizing a different aspect of the story.